These patch lists were created using the excellent program Cherry Picker. Both MOTU and Digidesign use the Mac OS X "middev" device description format. The appropriate middev files must be installed in order for midnam files to be recognized. If you have previously altered your middev files, you can copy and paste relevant sections from one file to another. Sadly, ProTools does not currently support mixing patches from different MIDI banks into a single virtual bank - which is exactly the trick that I've used in the Fireworx and DSP7000 patch lists. Because of this, for the time being, they remain compatible with DP only. The OASYS patch lists should be compatible with ProTools, however. The OASYS keyboard is the latest product I've worked on with Korg, and I'm quite proud of it. This download includes Mac OS X middev and name documents for Digital Performer, ProTools, and Cubase, along with patch lists for OS9's FreeMIDI. 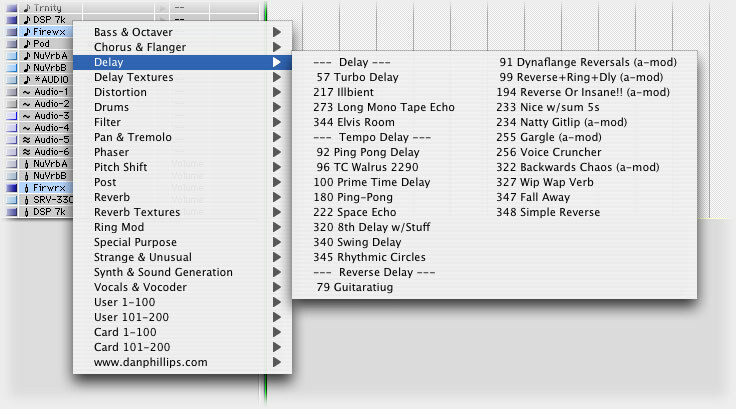 The Fireworx has tons of presets - 400 to be exact. There's a lot of good stuff in there, but it can sometimes be hard to find what you're looking for. After working with the Eventide DSP7000's relatively well-organized presets, I decided that I wanted to find a better way to organize the Fireworx patches. With this in mind, I took some liberties with the patch list, sorting the factory sounds into various categories. Some patches may appear in more than one category, when appropriate. I've also included hints to try out the alpha-mod knob in cases where the knob shifts the sound from one category to another. Hopefully, all of this will be useful to others as well. The screen-shot below shows an example of the categories and sub-categories. Note that this grouping is done only in the patch list; the internal Fireworx memory is completely unaffected. Make sure to set up the Fireworx MIDI preferences as described in the read-me file; otherwise, the patchlist may not work properly. The DSP7000 has over 800 presets in about 60 fairly well-organized banks. To minimize on-screen scrolling, I've sorted the banks into 25 main categories, with individual banks as sub-categories when necessary. The middev file includes entries for all recent Eventide devices, including the DSP7000.